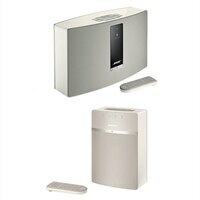 Bose - SoundTouch 20 III + Sound Touch 10 Speaker Wireless - WhiteThis bundle includes two speakers. Bose SoundTouch 20 III. There's a world of music out there. And this wireless music system is a great way to play it throughout your home - wirelessly. It connects directly to your home Wi-Fi network, so there's no complicated equipment to worry about. You can even play your favorite music instantly. Place this compact system just about anywhere around your home and enjoy clear, room-filling sound. Bose SoundTouch 10. The SoundTouch 10 wireless music system is an easy way to play music throughout your home. Plus, it's so small you can place it just about anywhere to stream millions of songs from music services, Internet radio stations and your stored music library - all with full, rich sound. You can even play your favorite music instantly. Simply press one of six presets on the speaker or remote, and the music starts. Plus, the remote lets you rate your music (thumbs up or down buttons) as you listen. This bundle includes two speakers.